She also left crucial information off her Senate questionnaire. As Senate Republicans continue their work pushing federal judicial nominees forward, one in particular is drawing special attention this week: Wendy Vitter, President Donald Trump’s nominee for a district court in eastern Louisiana. She will testify before the Senate Judiciary Committee on Wednesday morning, and will likely face questions about her history of anti-abortion advocacy and about speaking at pro-life events that she failed to disclose on her Senate questionnaire, a form that nominees are required to submit as part of the confirmation process. 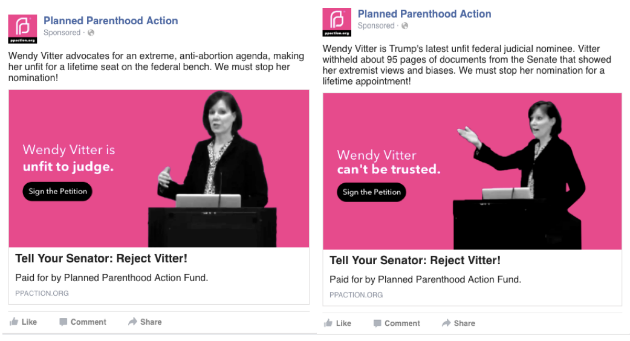 Planned Parenthood tells Mother Jones that its push to mobilize supporters against Vitter includes a petition calling the Senate to reject her nomination. According to the organization, it already has more than 20,000 signatures. At the same event, Vitter encouraged attendees to take seriously the views of another anti-abortion advocate, Angela Lanfranchi, who spoke to the audience about how “contraceptives cause cancer.” Vitter also promoted Lanfranchi’s brochures that claimed taking birth control increases women’s chances of dying a violent death. “Go to Dr. Angela’s website…download [the brochure], and at your next physical, you walk into your pro-life doctor and say, ‘Have you thought about putting these facts or this brochure in your waiting room? '” Vitter asked the audience. Sen. Dianne Feinstein (D-Calif.), the ranking member of the Senate Judiciary Committee, was displeased with Vitter’s questionnaire omissions: “I’m concerned that failures to disclose relevant information and materials to the committee are becoming a pattern under this administration,” she said in a press release in early March. Feinstein also noted that Brett Talley, a controversial district court nominee who also failed to disclose information in his questionnaire, has since had his nomination dropped by the White House. Vitter’s nomination was first announced back in January. After today’s testimony, her nomination will be voted on by the Judiciary Committee and, if voted through, by the full Senate. In addition to nominees already pending in the process, Trump announced his twelfth wave of nominees on Tuesday, continuing his mission to remake the judiciary in his own image.